Welcome to RailRiders and the world of adventuring. I often get asked this question: What is the origin of the name "RailRiders"? Surprisingly enough, RailRiders was not conceived in a Union Pacific freight car rattling across the country, but at sea in the prestigious Edgartown-Round-the-Island yacht race, off Martha's Vineyard. It was 1990, and I was one of 11 crew members aboard the 60-foot Talaria ("winged foot of Mercury"), skippered by an America's Cup-bound sea tyrant. It was the crew's job to "ride the rails" to increase overall boat speed. In yachting terms, we became what is called "railmeat." As water-logged ballast, we couldn't leave the rail during the 24 hour race except to feverishly work the grinders, which reeled the sails in and out. We stayed wet for hours in the six-foot running seas, and since the day was warm, we couldn't change into foulies. Instead, we just salt-stewed in our soaking-wet canvas pants that chafed our legs and refused to dry. You have plenty of time to daydream as bored, sedentary railmeat. I began considering the function of apparel. I wondered why no one had made lightweight shorts and pants from durable, quick-drying, water-resistant fabric that was also stylish for that ever-important aprés race pub celebration. My sodden railmeat-mates also agreed. I then drew some sketches which eventually became inspiration for RailRiders' initial two products: the technically innovative Jibe shorts (now called the Approach Shorts) and the popular Weatherpants, which years later were voted "best wilderness trail pants" by Backpacker magazine. When I started RailRiders in the early '90s, the product line was understandably limited. To attract new business, I placed small classified ads in outdoor magazines. Much to my surprise, something amazing started to happen. Accomplished explorers and adventurers began phoning me. 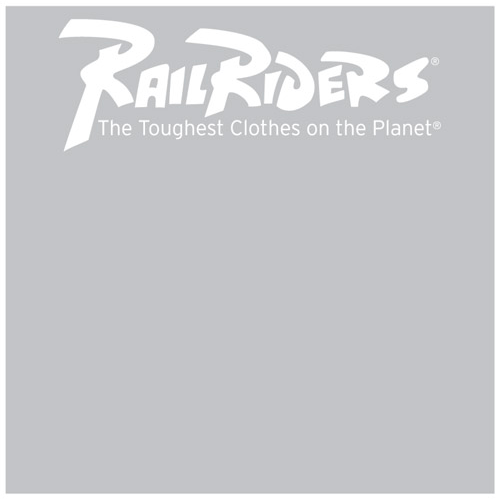 These brazen men and women, heading off to conquer the adventure of their dreams, were indeed curious about the technical aspects of RailRiders apparel which offered superior performance over that of natural fibers such as cotton or wool. These Weatherpants got frequently "invited" to go on the really big adventures. New Hampshire climber Rick Wilcox wore them on a significant portion of his successful Mt. Everest Expedition and sailor Cam Lewis wore them during his solo, record-breaking Transatlantic crossing. The company grew as the product line expanded, and the number of adventures dependent upon RailRiders increased. With my yacht-racing days behind me, I began to live vicariously through the exploits of these modern-day adventurers: Himalayan climbers, Micronesian eco-travelers, Appalachian Trail thru-hikers, Yukon River kayakers, and world-champion adventure racers. These adventurers - and their stories which you will find in our catalog - embody the RailRiders spirit. I am proud to be their outfitter - and to be yours. Whether you're trekking in the farthest reaches of Nepal or caught in a squall on an afternoon sail, you should expect your clothing to not only survive, but to thrive. These are clothes that go places. They are made to last. They were born at sea, but they're ready for everything.